Remedios Silva Pisa-Naci en el Alamo. Extended interview in French with filmmaker Tony Gatliff following video. Like many, I first became acquainted to this song through the movie Vengo. It plays a pivotal role in one of the scenes and the songs perfectly echoes the heartache and loss that permeates this film. 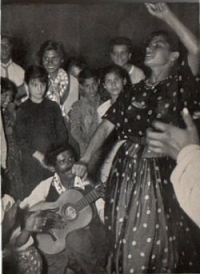 After the movie was released, many folks became obsessed with finding out more information about the singer Remedios Silva Pisa. Unfortunately, not much was available except for the rumor she recorded this song at age 16. I’ve recently tried to do a bit more research on her but have had little luck beyond what others have uncovered. I did discover the song is originally a Greek Romani song called O balamos , balamos and was originally sung in the Greek Gypsy dialect. The title of the song eventually became known as, “To tragoudi ton gyfton,” The song of the Gypsies. Some claim the song was composed in 1992 by Dionysis Tsaknis and performed by many famous Greek singers such George Dalaras , Paschalis Terzis, Eleni Vitali , Manolis Lidakis and the composer himself. Others say the song was originally released by an unknown singer called Yorgos Katsaris. Another popular version is by the Sephardic singer, Yasmin Levy. Yasmin’s father was Itzhak Levi, director of the Judeo-Spanish program at Kol Israel (Israel National Radio) for many years. She is well-known for her bridge building work between Jews and Arabs. Dos Lunares in San Francisco! Dos Lunares will once again have a small selection of Roma and Flamenco related books for sale at the Bay Area Anarchist Bookfair. If you live in the area, please come stop by for a visit! Thanks to Bureau of Public Secrets for the text and info. Welcome to Dos Lunares 2008! This a personal, not-for-profit project dedicated to educating, informing, sharing and learning about music of the Romani diaspora with a specific focus on Flamenco. While many people think of Flamenco as primarily a dance, it should be noted it is much more than just dance, it is a lifestyle and unique cultural expression born from the rich history of Andalucia. This is from the series ‘Rito y Geografia del Cante.’ Que arte!